Fantastic News — I’ve got a Publisher! I finally have a publisher! Details will follow soon, after they’re finalized. But I couldn’t be more excited and hopeful that my publisher’s backing and reach can take this project to the next level. Selling 3,000 copies is great, but my goal has always been 100,000 copies. Now there may be an actual chance of that happening. Inshallah. So many thanks to my wonderful agent, Helen Zimmermann, for getting this book in the right hands at the right time! I’ll have to keep working hard to promote it, of course. But at least, and at last, I won’t be alone. Now — one thing this all means is that pretty soon I’ll have to take my own sales channels offline. The book is scheduled to come out (in its new incarnation) next spring, hopefully along with reviews in mainstream sources. It wouldn’t be right to have the old version lying around on Amazon for people to pick up after my publisher has spent all that time and effort on publicity. Also, the new version may involve some cutting down or altering of the manuscript. So if you want to read the current, full version of the book, you should act fairly quickly. 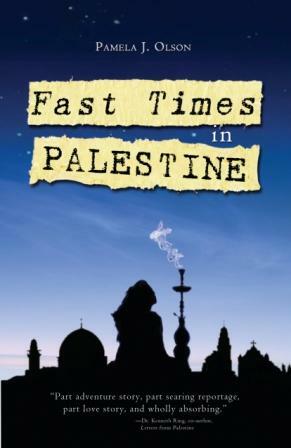 The best place to buy the paperback version right now is at the Palestine Online Store, run by my friend Haithem El Zabri in Austin, TX. It’s the same price as Amazon, and for a low flat shipping fee, you can also buy unlimited amounts of healthy and delicious Palestinian olive oil, kuffiyehs (the famous black and white scarves), hand-crafted olive wood sculptures, books, films, all kinds of mouth-watering food items, and much more. I did nearly all my Christmas shopping there this year and was delighted with the quality of the items — it works well for Mother’s Day, too! Also, you can still (at least for now) buy the eBook for $2.99 at Amazon. Exciting times. Thanks so much for sharing this journey with me through so many ups and downs. I found a copy of this song in an email years ago. It’s written by something precious and rare: an anti-war country singer. In case you can't read it, the first side is a mega-corporation saying, "Help! Bail me out, save capitalism!" 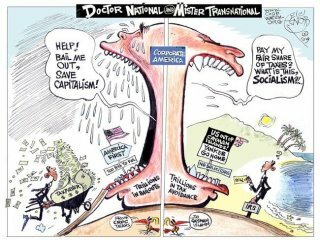 The second is saying, "Pay my fair share of taxes? What is this, socialism?!"